The "generation gap" is today a world-wide malady, affecting the relationships between parents and children in many ways. Discipline in the home is often parents' greatest challenge, with children bridling at restraints that do not exist in the permissive society in which they live. They often regard their parents as being "out of touch" and unable to understand them and this can lead to a breakdown of parental authority. In addition, the warm, loving and trusting relationship which once existed between parents and children has eroded. 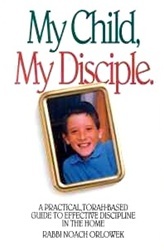 My Child, My Disciple helps a parent and child, and aids the parent in rectifying or preventing these causes. Replete with Torah sources and drawing on the rich experience of presenting Torah luminaries, My Child, My Disciple is an important practical addition to the literature on this all-important subject, childbearing.